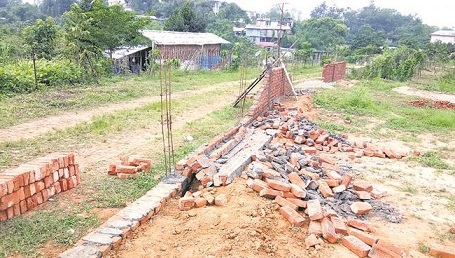 Simmering tension prevailed along Assam-Nagaland inter-state boundary after Assam Police personnel demolished a wall on Monday that was being constructed at Rilan village claimed that it fell under reserved forest area of Assam. However, the villagers refuted the Assam Police’s contention and claimed that they possessed land pattas and had been paying tax to the Government of Nagaland for the past 10 years. The incident was later defused in the evening after officials of Dimapur and Karbi Anglong districts met and discussed the matter at Rilan village. Both sides decided to conduct a higher-level dialogue to arrive at an amicable solution on the issue. Meanwhile, executive magistrate of Karbi Anglong, A Bemthoi demanded that all construction activities in the area should be stopped and that both sides should maintain status quo. She also claimed that Assam Police personnel had demolished the wall as it fell under reserved forest area of Karbi Anglong in Assam. The executive magistrate further urged the villagers not to undertake any construction activities until a legal solution to the boundary issue was arrived at. On the other hand, Dimapur sadar SDO Zubenthung Ngullie demanded that the district administration should be intimated prior to any demolition drive. He alleged that Assam Police personnel did not follow the standard operating procedure while taking up the demolition drive. Earlier, the villagers claimed that around 40 personnel from Assam Police entered the village in the wee hours of the day and demolished the wall that was under construction.